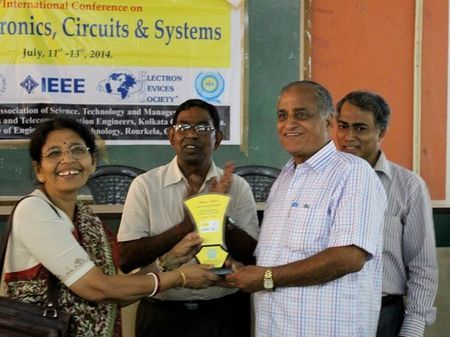 Microelectronics, Circuits and Systems, 9-10th July, 2016, Kolkata, India. Yuvabharati Stadium: Largest stadium in India. N.B Kindly note that as per the SNB Guest House rules, children below the age of 10 years are not allowed to stay in the Centre's Guest House. Only one guest can stay in a single bedded room and a maximum of two guests can stay in a double bedded room. Guests' vehicles cannot be parked in the Centre's premises during the night. The guests would be required to submit photocopy of their Photo ID during check-in. Foreign guests will have to submit photocopy of their Passport and Indian Visa. The check-in time is 12.00 Noon and the check-out time is 10.00 AM beyond which another day's charge has to be paid. Beside Nicco Park, towards SDF more Salt-Lake. Or beside CTS Salt Lake. Students accommodations will be provided by conference committee in share basis for maximum of two nights. This facility will be for 9th July 8.00AM to 11th July 8AM(it may change as hotel's rules and regulations). If accommodation is required before/after these two days, delegates have to bear those expenses. For international students (rather than SAARC countries) delegates three nights accommodations will be provided in hotel. If more nights stay is required, they have to bear expenses for extra days. Delegates have to bear Local to and from conveyance from/to Airport/Hotel/Venue of conference. But, our volunteers may help to arrange vehicle/car. For confirmation of hotel/Lodge rooms, minimum one month before Journey plan , in and out date /time should be informed to us. Without in/out date/time confirmation, it is not possible to book rooms. Other delegates as Professor/Faculty/Ph.D Scholar/JRF should pay hotel charge by themselves. You can request for general accommodation as paid basis, but your in/out date/time must be informed one month before. or , You can arrange better accommodation by ownselves. All delegates should have photo Identity card as required for hotel room booking. Delegates should arrange ownselves to reach at Venues for both days. Kindly note that checkout time is 9:00AM. Working time tiffin/snacks/Lunch will be provided by us but, dinner arrangement to be arranged by ownself. N.B. for staying in Hotel/hostel delegates should have xerox copy of valid photo ID card with them . For any unavoidable circumstances, like weather calamity, disaster or for political reasons, if delegates need to stay more than two nights they have to bear extra charges. Conference authority will not be responsible for that. Lady delegates should stay with their own responsibilities and security, for that they may come with their group members/friends(if they think). If anyone wants to stay alone in a double/triple room, they have to bear extra charges. Delegates have to arrange ownselves to attend Conference Venue from hotel/hostel/airport by their own arrangement. CCSN2015: Valedictory Session: Audiences at Science City Seminar Hall, Kolkata, India. Micro22014: Delegates in opening Session at Hotel Hyatt , Saltlake, Kolkata. CCSN2015: Dr. Susanta Pal (Scientific Officer , Grade H+) is delivering speech within Cruise Ship M V Paramhansa, in Kolkata , India.